An adventure in American history and scenic beauty. A trip to some of the spots on the grandest American expedition ever, where Lewis & Clark's "Corps of Discovery" expedition crossed the rugged Bitterroot Mountains. Our 2013 adventure took us to the remote Bitterroot Mountains in North-Central Idaho where we took remote trails and visited some of the sites where the famed Lewis & Clark Expedition passed through this rugged region in 1805 and 1806. We also traveled along the "Wild and Scenic" Lochsa and Selway rivers, visited Selway falls, and the peak of Fog Mountain. Additional trip features included a fun river rafting trip on Tuesday and participation with ten Syncros in the Grangeville "Border Days" 4th of July parade! Syncro Safari, Idaho '13 took place Sunday, June 30th through Saturday, July 6th, 2013. This gave us the perfect opportunity to celebrate 4th of July on our trip quite close to where Lewis & Clark spent their Independence Day in 1806. Where are the Bitterroot Mountains and the Lochsa River? The Lochsa river runs mostly west and south in a canyon away from the high points along the Idaho-Montana border in the southern part of the Clearwater National Forest. South of the Lochsa is the Nez Perce National Forest, the Selway-Bitterroot Wilderness, and the Frank Church - River of No Return Wilderness. Together with about 3.9 million acres, these wilderness areas make up the largest area in the USA outside of Alaska. There's no Syncro access in the wilderness, since by definition a designated Wilderness must be roadless. 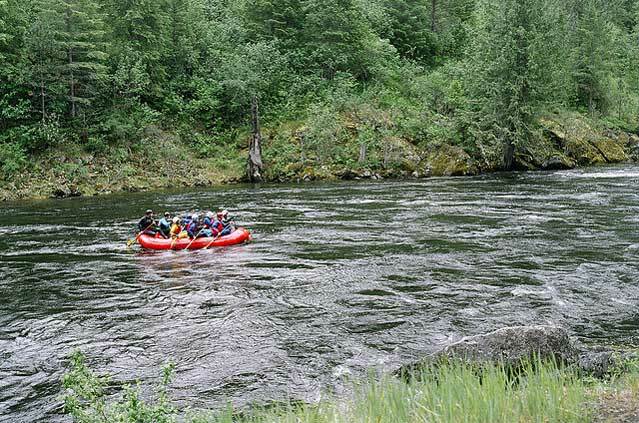 Recreation in the area is highlighted by backpacking, fishing, and whitewater rafting. http://www.fs.usda.gov/nezperceclearwater for the Nez Perce and Clearwater National Forests web site. Arrival day. Met other participants at Camp SYncro (Glade Creek Campground) on Hwy 12 along the Lochsa River. 4-wheeling. Route was up the Selway River to Selway Falls, Fog Mountain, and Selway Crags viewpoint. Group river rafting trip down the Lochsa and Clearwater or free recreation day. Tuesday Taco Night! 4-wheeling route along the eastern end of the "Lolo Motorway" to the Lewis & Clark trail sites. Border Days 4th of July parade in Grangeville - 10 Syncros in formation! Celebrate 4th of July in Syncro style! 4-wheeling route along the western end of the Lewis & Clark trail through the Bitterroots and out to the valley at Weippe where the Corps of Discovery was aided by the Nez Perce tribe. Trip complete. Packed up, said our goodbyes and headed home. For all other meals, we each provided for our own, but for Tuesday's "Taco Night" we coordinated our efforts and created a amazing Taco Fiesta dinner to share. Delicious, with plenty of desserts too! :-) Yum! Huckleberry/apple pie and tres leches cake! We were able to share our taco fiesta with a couple of local guests who visited our camp for a little education on Lewis & Clark history and the Nez Perce fisheries operation. Kent Hills provided an informative talk on the Nez Perce fish hatcheries operation and Rhon Lyons helped to educate our group on the Lewis & Clark trek through the Bitteroots. A special thanks to Rhon and Kent! The "digital photo scavenger hunt" has quickly turned into one of the favorite features of Syncro Safari! We had three rounds of photo hunts during Syncro Safari week. Syncronaut teams get lists of particular items to take photos of. Each Syncro is a team that tracks down these sites or people or activities (or whatever's on the list) and takes a digital picture. Back at camp, we share the photos and see who snapped what. The team with the most matching photos won the AAA award. Appreciation, Applause and Accolades and a real prize! A feature that started in 2010 and has been a part of each Syncro Safari since is "Syncrocaching". Syncrocaching is Syncronauts using Syncros to place and find geocaches. Ever heard of Geocaching? Geocaching is a high-tech "treasure" hunting game played throughout the world by adventure seekers equipped with GPS devices. The basic idea is to locate hidden containers, called geocaches, outdoors and then share your experiences online. The web site http://www.geocaching.com provides all the details. At this year's adventure we placed one real Syncrocache and one "virtual" cache to encourage other Syncro owners to visit these spots. Alcohol in moderation is allowed at Syncro Safari events, but not drunkenness, nor any drinking before or during driving. Just bring enough for yourself, and maybe a little sharing. Remember, this is a family event, not a kegger party. The weather during our trip was unseasonably warm with overnight lows of about 60F and daytime highs around 100F in the beginning of the week. By Friday, the temperatures had cooled to about 80F in the afternoon and around 50F for an overnight low. Skies were clear with no rain and only a few whispy clouds floating by. 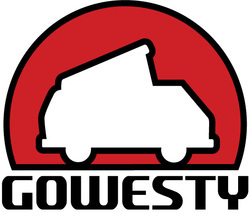 GoWesty was a generous sponsor for Syncro Safari, Idaho '13. Thanks GoWesty! !